I should be ashamed of how quickly my household polished off Le Caramel’s caramel topping, caramel syrup, and caramel candies. But, it’s too good to feel bad about it. Granted, I think we finished a 14 oz jar of caramel topping in about one week, but hey, I took one for the team- to help you make good candy decisions. I know, I know… I do what I can. I’m no gourmet caramel connoisseur, but, this was much better than your run-of-the-mill caramel. It was thick, creamy, and decadent. 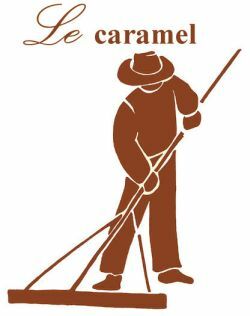 All of Le Caramel’s products are fantastic. I tried to put the salted butter caramel topping on anything I could find. I put it in my coffee, on ice cream, and on apple pie with ice cream. All were excellent ideas. I didn’t have any ice cream on hand (a crime in and of itself) so I bought some specifically for this caramel. I didn’t cheap out because I felt this caramel deserved the best vanilla bean, name-brand stuff. Crazy delicious! I was recently given the opportunity to try a box of Ococoa’s Butter Cup Collection. I thought I knew chocolate. I thought I knew what flavors go well with chocolate (peanut butter, mint, and Sunkist, to name a few). 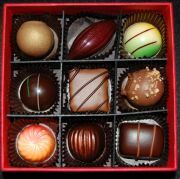 I thought I knew what to expect from a box of chocolates. Then came Ococoa. That is a very pleasant, very enticing way to open a package. Itâ€™s about time someone engaged in meaningful political discussion. Candidates today are so consumed with the economy and war that they are neglecting some of the most important issues out there, i.e., candy. Thanks to L.A. Burdickâ€™s chocolates, confection is now playing an important roll in our countryâ€™s future. Burdick is offering quarter and half-pound boxes of bonbons, each designed for the two major candidates running in Novemberâ€™s election. Boxes are adorned with their respective partyâ€™s seal and a color-coordinated ribbon. 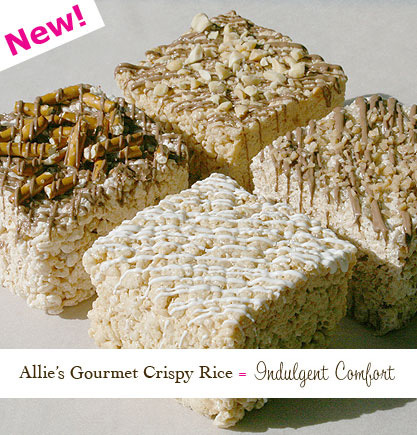 Within each box are four flavors inspired by the background and likes of the two candidates. Team Obama is sporting Hawaiian-Pineapple, Kenyan Coffee, Kansas Corn Crunch, and Tennessee Sour Mash. Meanwhile, the McCain end includes Arizona Citrus, Hot Pepper Tequila, Peanut Butter, and Kentucky Rye. For every box you purchase, a vote will be cast for that partyâ€™s assortment. Though the results are still preliminary, and boxes will be sold until the November election, Obama has jumped out in front to command the early lead. Are you happy about this? 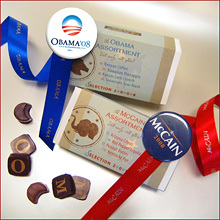 If not, buy a box or two or fourteen to throw your support to the McCain team. Could the promise of Kenyan Coffee be alluring enough to get even the most die-hard Republican to vote Democrat in this case? Remember, democracy only works if everyone participates (and in this instance, it costs between $15-28 per vote).